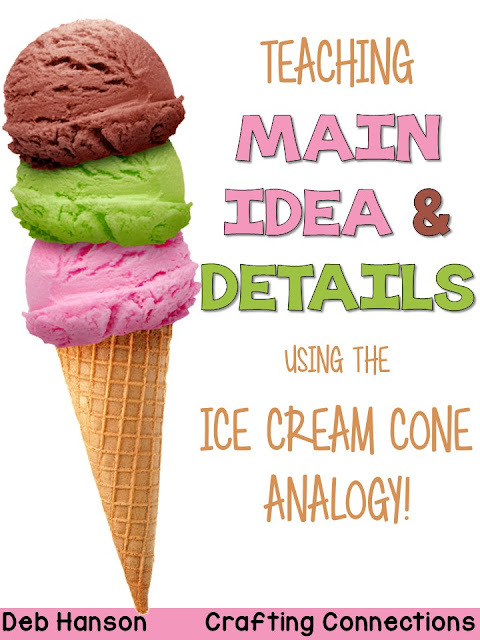 There was a time when I dreaded teaching the topic of main idea and supporting details. Trying to teach students how to read a passage and pick out the main idea and key details was both challenging and boring. One year, the time came, and I knew that I needed to "spice things up"... or maybe I should say "cool it down" :) for my own sanity. I've always had a sweet tooth, so I decided to create materials that reflected the following ice cream cone analogy. 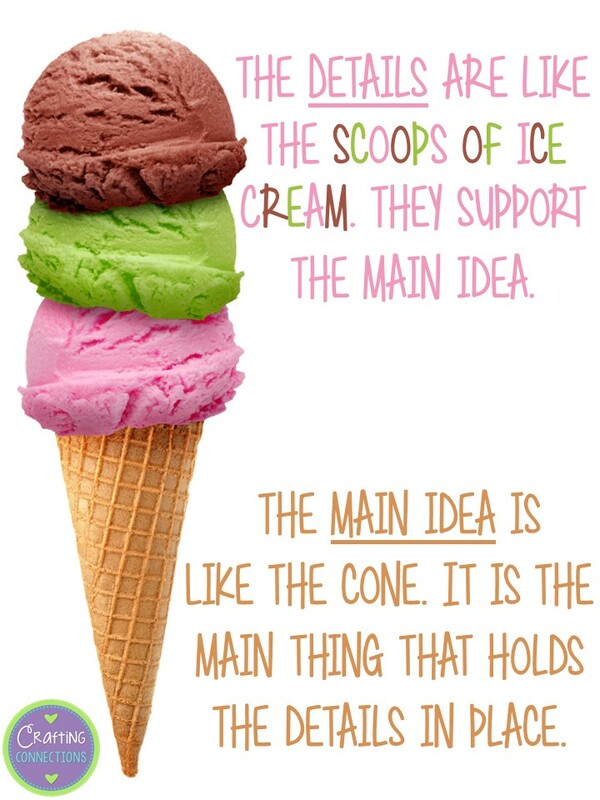 As I reflected upon the entire unit when it came to a conclusion, I realized that for the first time in my teaching career, I actually enjoyed teaching main idea! Furthermore, my students seemed to enjoy it, too! Best of all, though, was that my students seemed to truly grasp the concept. I witnessed success like never before- probably because we all had fun. Needless to say, I have continued to teach main idea using the ice cream cone analogy, and I really don't ever see myself not using this analogy. When I introduce this anchor chart, I read the paragraph with my students, and I ask them what the paragraph was mainly about. A student often replies "bees", and then I remind everyone that "bees" is the topic of the paragraph, but to state the main idea, we have to dig a little deeper. I assist by asking "What about bees? Is this passage mainly about how to protect yourself from a bee that's flying around your head?" This seems to really click with some of the students. After they finish giggling, I tell them to turn to a partner and discuss what the passage is mainly about concerning bees. 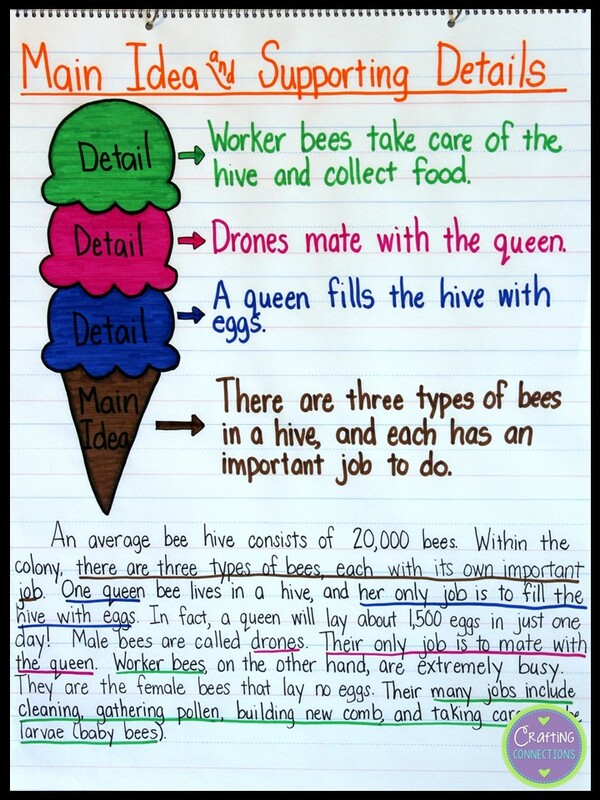 Once we determine the main idea, it is pretty simple for the students to pick out the three most important details. As you can see, we underline the detail sentences in the paragraph. We also talk about how some of the statements were interesting facts, but they didn't necessarily support the main idea sentence. 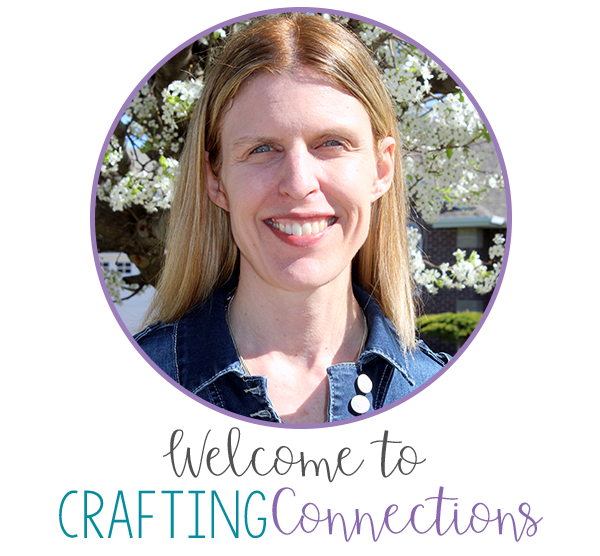 We also talk about how main idea questions are commonly found on standardized tests. I have found that many students do not understand that "What would be the best title of the passage?" questions are actually main idea questions. Once they understand this concept, they are better equipped to answer test questions. They know to determine the main idea rather than just make a subjective decision about which title is best. If you wish to use this anchor chart lesson in your classroom and you want students to be able to follow along on a mini anchor chart, click HERE to download my student version. 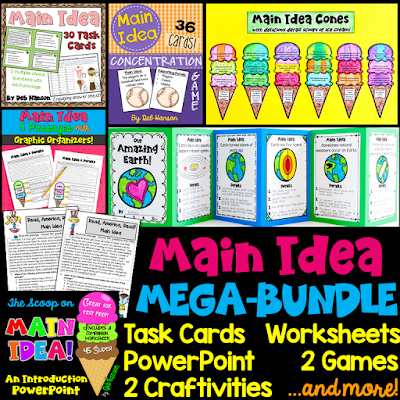 If you would like to take a look at the main idea resources available in my store, click HERE. This listing also has links to the individual resources that are shown. 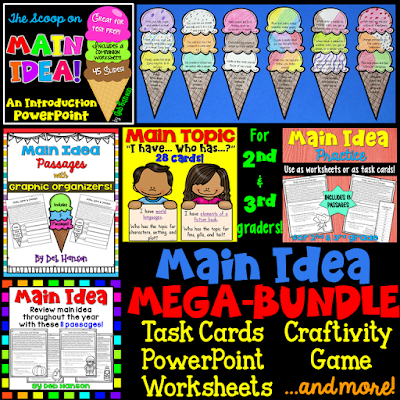 This bundle is designed for 2nd-3rd grade students. 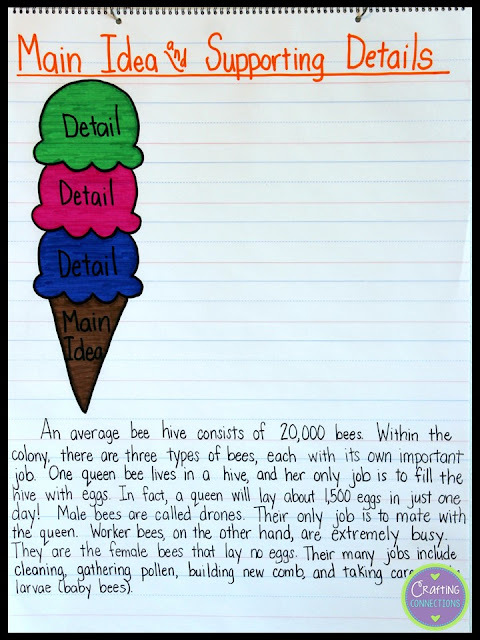 I also wrote a follow-up post explaining how I use a reusable main idea anchor chart across subject areas. Click HERE to read that post. We were right in the middle of main idea when we ended up on strike for a month! This will be perfect for getting back into the swing of things on Monday. Thank you!!! What grade is this suited for? I created this anchor chart with third graders in mind, but I think it could work for grades 2-5. Thanks for visiting! Thank you so much! Using this lesson this week.